Monkey Puzzle Blog: New Car! 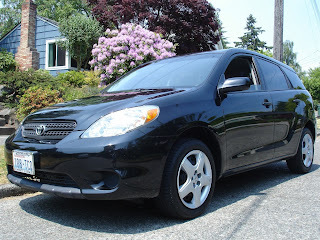 I am now the owner of a 2005 Toyota Matrix! My requirements led to a choice between Subaru wagons and this car. The Toyota won due to better fuel economy. In the picture is my Giant TCR road bike, fitting nicely in the back without taking off the front wheel.